Train your brain with challenging puzzles and awaken your inner stylist with a perfect design!Welcome to Home Designer – Makeover Blast, where dreams of the perfect home designs are realized!Help your clients turn their drab living space into fantastic rooms! 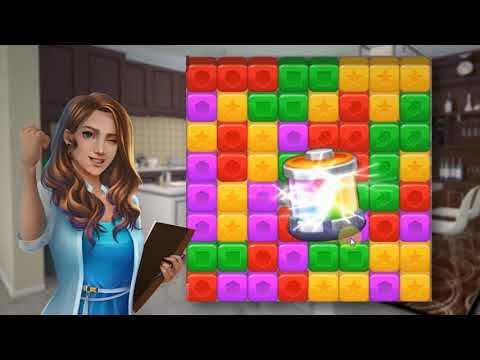 Solve matching puzzles to design and decorate the perfect home with beautiful furniture! From Rustic to Modern, from Contemporary to Victorian, from Shabby-Chic to Industrial. We’re counting on your home design expertise! Do you have what it takes for the most addicting puzzle game ever? Your clients are counting on you to make their dream home comes true!Features:- Play hundreds of addicting BLAST puzzle levels and unravel interesting stories of each client!- Bright colored levels, one-finger gameplay, satisfying POWER-UP animations!- Design and decorate a variety of rooms from Living Room, Bedroom, Dining Room and many others in the home to come!- Enjoy puzzle gaming that gets just a bit more difficult gradually as you progress through the levels!- With free and regular updates, you’ll always have fresh and new content to play every day!